They all smell true to their name, and right now I'm on a peppermint kick, so that's my personal favorite. I plan on making some peppermint bark candy and putting little packages together with the Peppermint Bliss Shimmer Body Wash, and bath gloves for the kind ladies who work in my veterinarian's office. They all smell wonderful and they leave my skin feeling soft and silky. I love how they make my bathroom smell after a shower! These feel much more luxurious than $1.98. The only bad thing I have to say about these is that they are limited editions, so if you fall in love with one of the scents, you'll need to stock up! Holiday Pear and Toasted Vanilla sound good to me. I love body washes. I have tons of them from Philosophy. I bought them from QVC and got them quarterly. Still haven't used them all. I never use bath soap only body wash. Makes my skin feel much softer. Thanks for all the gift advice. Sara S.~Walmart I believe is the only store that carries them. Dori~good deal at Big Lots! I need to stop in there more often :) I am on a huge peppermint kick right now. I'm burning peppermint tarts, using this body wash and wearing my B&BW Twisted Peppermint products a lot! I'm a sucker for holiday smells...but know that a lot of drugstore products are not the gentlest on the skin. 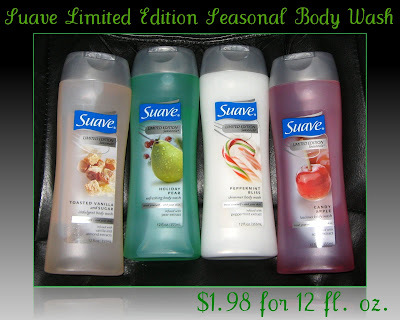 Anyone have a rec for a gentle skin cleanser with a smell as good as what Suave makes?